FILE - Pakistani journalists protest to condemn an attack on their colleague, Ahmed Noorani, pictured in the poster, in Karachi, Pakistan, Oct. 30, 2017. Journalists in Pakistan say they are facing increasing risks ranging from the government's expanding control over social media to extremist threats that have spread from long-volatile regions to the streets of the capital. The latest attack left a journalist badly beaten on a street in Islamabad. Earlier this year, security agencies picked up several bloggers from urban centers who said after their release that they had been tortured and humiliated. Threats to reporters have long been a problem in volatile Baluchistan and the tribal areas along the border with Afghanistan, but the recent incidents have reinforced complaints by media groups that the danger is spreading to the nation's heartland. The victim of the beating in Islamabad was Ahmad Noorani, a senior reporter for the influential Daily News newspaper, who previously had been warned to close his Twitter account after criticizing the powerful military. The attack attracted widespread condemnation on social media, where many posts blamed Pakistan's intelligence agencies for the attack. Other journalists have been charged with violating the country's vague Anti-Terrorism Act, which defines terrorism as creating "a sense of fear or insecurity in society." Critics say it has broad potential for abuse. Several bloggers critical of the government or the military have vanished for weeks, later saying they had been kidnapped by the intelligence services. Popular blogger Asim Saeed was snatched by unknown men earlier this year. He told the BBC in an interview last week that he was picked up by Pakistan intelligence agencies and tortured during his detention. 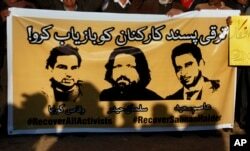 FILE - Members of civil society hold a banner with pictures of missing rights activists, Waqas Goraya, Salman Haider, and Asim Saeed, during a demonstration to condemn the missing human rights activists, in Islamabad, Pakistan, Jan. 10, 2017. Digital media rights activists, meanwhile, are warning that Pakistan is attempting to cut back on internet freedom. "In my opinion, the government is terrifying the social media activists," Usama Khilji, director of the internet freedom organization Bolo Bhi, told VOA's Deewa service. "Social media is a democratic medium where people can express their thoughts without any restrictions. However, it has been observed, when people share their thoughts, the government feels insecure." Anwar Iqbal, a Washington-based senior journalist and correspondent for the leading English-language newspaper Daily Dawn, agreed. "The Pakistani state feels vulnerable in the presence of growing social media and wants to stifle the discourse on topics it considers sensitive," he said. The state does not want media to discuss sensitive issues like relations with the U.S., China, Afghanistan and India, Iqbal said, particularly in light of President Donald Trump's new policy for the region calling for Islamabad to crack down on terrorist safe havens. Human Rights Watch's 2016 report said media were being deterred from reporting on or criticizing human rights violations by the security services. "Many journalists increasingly practiced self-censorship, fearing retribution from both state security forces and militant groups. Media outlets remained under pressure to avoid reporting on or criticizing human rights violations by the military in counterterrorism operations," the report said. Reporters Without Borders, a global media watchdog, in its annual report this year, ranked Pakistan 139 of 180 countries on its Press Freedom Index, despite its reputation having one of the most free media environments in Asia. The report says the nation's media "are targeted by extremist groups, Islamist organizations, and the feared intelligence agencies" — all of which are on the group's list of "Predators of Press Freedom." Even when the threats come from extremist groups, journalists say, the government has done little to pursue the perpetrators. But Interior Minister Talal Chaudry defended the government's actions, suggesting the reporters should be doing more to protect themselves. FILE - Journalist Zafar Achakzai, who was held for sharing content criticizing security forces on social media, sits in his office after being released from jail, in Quetta, Pakistan, July 9, 2017. "We have included insurance for journalists in the journalists 'protection bill," he said. "Sometimes, journalists are not trained or not properly equipped, and that is why they become victims of violence. We understand journalists are sometimes victims of violence, and that is why we are bringing a comprehensive bill for working journalists in the parliament." But many journalists say things are getting worse. A recent cybercrime bill has become a vehicle for curbing media freedom, allowing the government to censor digital content, criminalize internet user activity and access bloggers' data without judicial review. Media defenders say the country's blasphemy laws also are being used to cut off public debate. "We have laws in place for social media, but it's not being controlled," Religious Affairs Minister Sardar Yousef told Deewa when asked how the government can avoid the blasphemy law from being misused against social media. Such problems are longstanding in Pakistan's troubled southwestern Baluchistan province, where newspapers have been shut down and newsstands shuttered for more than a week amid threats from militant groups claiming the local media are too supportive of the central government. "The resistance [militant] groups are calling on boycotting all media houses, threatening press offices and journalists," Behram Baloch, who is now working from home, told VOA. "To address this issue, we held a meeting here at the press club. We decided to suspend our activities for a while, and press club will remain closed. Our movement is limited, and many of our colleagues have left their jobs." Militants from separatist groups, banned by the state, threw a hand grenade at an office of a newspaper agency in Turbat, Baluchistan, injuring eight people. "Journalists as well as the Newspaper Editors Council received threats. As a result, our workers were forced not to leave their homes. They include press workers and hawkers. We were, thus, unable to pick up newspapers [for delivery]," said Mir Ahmed, general secretary of the Newspapers Wholesalers Association. "Life and death are in the hands of God." VOA Urdu contributed to this report.